Growing your own vegetables doesn't have to result in a dreary harvest of carrots, onions and potatoes. Take inspiration from this interesting edible. Often described as a little Sputnik, Kohl Rabi may look like something from out of this world, but this member of the cabbage family is very down to earth. Growing just above-ground, Kohl Rabi is an easy and prolific vegetable to grow, it doesn’t need an exotic climate to thrive and will be quite happy in a garden. Kohl Rabi 'Noriko' is a pale green skinned variety of Kohl Rabi. This bolt resistant variety produces uniform plants of high quality for May to October production. It can be harvested when small, for use as a baby vegetable or grated on salads. The leaves are also edible. Sow successively from February, the plants will withstand light frost. Harvest when the stem swells to 7 to 12cm (3 to 5in) and is easily visible above the soil. Kohlrabi is crisp with a delicate, sweet flavour and incredible crunch like a water chestnut. The young stem in particular can be as crisp and juicy as an apple, although much less sweet. The outer skin peels off without much effort to uncover a dense white flesh. The taste is difficult to describe, if you can imagine a cross between a pear, a turnip, and a potato; but with notes of cauliflower and celeriac. Either way, it's delicious and I would wager that most people who try it will be surprised and really enjoy the taste. In the kitchen, it's great for slicing or shaving into a salad, shredding into coleslaw, stir-frying, or roasting with a meaty entrée. The leaves are quite a treat, too, slow cooked like you would other greens or sauté with garlic and olive oil. The plants grow best during cool weather and can be raised as a spring crop or be included in an autumn vegetable garden. It is low growing, reaching about 30cm (12in) in height. It matures quickly, progressing from sowing to harvesting in a couple of months. Most growth will occur in cool weather. If you can only have one crop, grow the autumn crop, as the Rabi will grow best, and taste its best, if it matures in cool weather. They are not quite hardy enough to be classified as a winter vegetable, but they do withstand frost and will grow long into the autumn growing season. A little snow is of little worry, if the weather is expected to go much under -5°C (the low twenties °F), you can cover any remaining plants for a day or two until the temperature inches up a bit. This seed has been organically produced. The seed has been harvested from plants that have themselves been raised organically, without the use of chemicals. All brassica crops grow best in partial-shade, in firm, fertile, free-draining soil. Start digging over your soil as soon as you can brave the elements. Remove any stones you find and work in plenty of well-rotted manure or compost. Tread on the soil to remove air pockets and to make the surface firm. Brassicas will fail if the soil is too acidic; add lime if necessary in winter, aiming for a pH of 6.3 to 6.8. In spring apply fertilizer and sprinkle Bromophos if cabbage root fly is known to be a problem. Prepare the seed bed a week later, tread down and rake the surface. For a late autumn or winter crop sow a purple variety in July to the end of August. Germinates in around 10 days. Expect a yield of 20 globes from a 10ft row. Sow very thinly 1cm (½in) deep, 7.5cm (3in) apart in rows 30cm (12in) apart. Cover with soil. Thin the seedlings to 6in (15cm) apart. Replant the thinnings. Hoe regularly and feed every three or four weeks. Mulch to deter weeds and conserve moisture. Keep moist at all times for the most succulent roots and to minimise woodiness, bitter flesh and bolting. Make sure they get at least an inch of water a week, soak the ground during periods of drought. Many of the brassica problems are occasionally seen, but they are not likely to be serious. The crop matures quickly and so it is not affected by diseases which develop slowly or pests which are at their peak when kohl rabi is absent from the garden. Rotate your crops, plant brassicas in the same ground only once every four years. Pick as much as you need, and let the remainder continue to grow, pull as required until December. 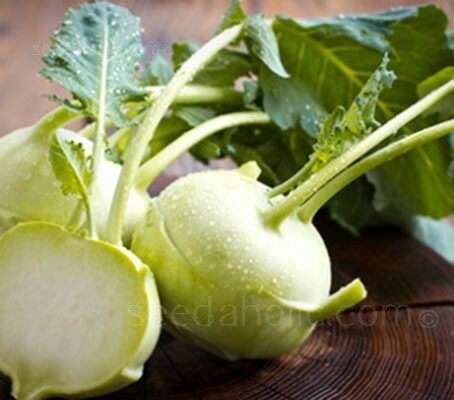 Fresh kohlrabi stores up to a month in the fridge, or 12 months in the freezer, providing it has been blanched. When eating raw, trim the outer green leaves and peel the skin. Chop, grate or slice and add to coleslaw and salads, vegetable platters or use as a substitute for cabbage, radishes and water chestnuts. To liven up soups, stews or stir-fries, add some cubed kohlrabi near the end of cooking so it keeps its crunch and distinctive flavour. Kohl Rabi might look like an alien life form, but it is thought to have been deliberately developed in Northern Europe during the 16th Century. It was created by artificial selection for lateral meristem growth; its origin in nature is the same as that of cabbage, broccoli, cauliflower, etc: They are all bred from, and are the same species as, the wild cabbage plant (Brassica oleracea). The kohlrabi plant was named by botanists as Brassica oleracea variety caulorapa, with the last word meaning, "stem turnip." The name comes from the German Kohl meaning “cabbage" plus Rübe ~ Rabi (Swiss German variant) meaning ”turnip", because the swollen stem resembles the latter. However, the actual "Kohlrübe" exists too and corresponds to the rutabaga in English, the swede which is distinct from the kohlrabi. Green, white and purple skinned varieties exist, the most popular being light green, although the purple variety is less common, it is also sweeter. The greenish skin types are called "White Kohlrabi." Purplish-skinned Kohlrabi is sometimes called "violet", and other times called "red." Regardless of skin colour, all types are white inside.